This was an eight day cruise from Fort Lauderdale, Florida calling at San Juan Puerto Rico; Labadee, Haiti; St. Maarten; and St. Kitts. The first time I went aboard Freedom of the Seas was just before she entered service. Royal Caribbean had brought the ship to New York City to showcase the world's largest cruise ship prior to taking her to Florida to begin her regular itinerary of Caribbean cruises. At the time, she appeared to be amazingly big with all sorts of features designed to elicit a wow such as the first surfing simulator at sea. Now, many of Freedom's innovations have become fairly standard in the cruise industry and this year she will drop out of the list of the top 10 largest cruise ships. However, in the intervening decade, Freedom has grown into a new role. Freedom of the Seas presents the core Royal Caribbean cruise experience. Royal Caribbean presents several different cruise experiences. There is the cosmopolitan but relaxed experience of the Quantum and Radiance ships; the classic style of the Vision class; and the city at sea experience of the Oasis class. However, the experience that most people think of when they think of Royal Caribbean is the experience offered on the Freedom and Voyager class ships. It is a big ship experience with lots of people. It is active and family-friendly. It is aimed toward middle class America but attracts an international audience. The décor is often flashy but not cheap. The experience is casual but not without quality. On this cruise, Freedom excelled in this role. The ship was well-maintained. Each element of the Royal Caribbean formula was done well. 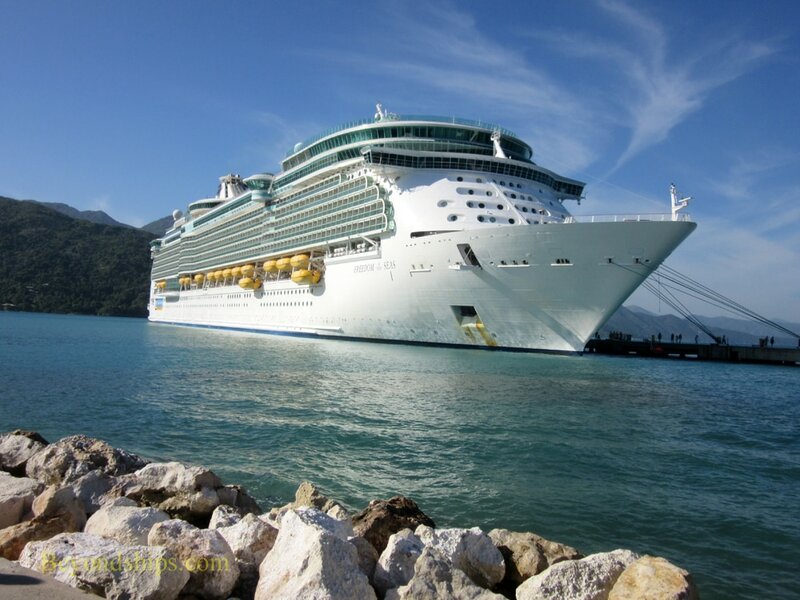 For those of us who have cruised with Royal Caribbean numerous times, it had a very comfortable familiarity. The main dining room is a grand structure with three levels. It is visually quite impressive. For dinner, guests can select either the traditional dining system (assigned dining times and tables) or a flexible dining system (come when you want but no guarantee of the same table or staff). For this cruise, I selected the flexible dining system. It worked well. I was seated promptly and the service was good. (Note: On all cruise ships, I try to avoid the peak dining times of six to about 7:30). For breakfast and lunch (sea days), the main dining room is open seating. The lunchtime jewel is the Tutti Salad bar. It stretches the concept of a salad almost beyond recognition. At a station in the middle of the dining room, guests tell the staff which of the vast array of ingredients they want. In addition to varieties of lettuce and vegetables, there are cheeses, shrimp, smoked salmon, prosciutto ham and, of course, several different dressings. It is a meal in itself. Freedom has three specialty restaurants, all of which were very good (See separate review). Of the casual dining venues, the design your own pizza option at Sorrentos was very enjoyable. You select which of the toppings that you want on your individual size pizza and it is baked for you in about 10 minutes. I have tried this option on other ships but the ones I had on Freedom tasted best so far. The main entertainment venue on Freedom is the theater. There were two shows each night timed to harmonize with the early and late seatings in the main dining room. No reservations were required for the shows. The production shows performed by the ship's cast were conventional musical revues. I have come to prefer these shows over the productions of full Broadway musicals that are done on other cruise ships. First, in a Broadway show, the music is usually the music of one composer or often one musical group. If you don't care for that composer or that group, the entire show is a loss. A conventional production show incorporates the music or a number of composers, so there is a better chance that you will hear something you like. Second, if you are a frequent cruiser and come back to a ship often, a show with a plot loses its appeal after two viewings. Alternating with the production shows were shows by visiting artists. These were all of good quality with the Motown-style show of Marcus Terell & The Serenades the most memorable. In addition to the theater, Freedom has shows in Studio B, the ice rink. These shows are theatrical productions with lighting music and costumes as well as virtuoso skating. The Royal Promenade is also used for entertainment. Dance parties and theme nights attract a sea of humanity. From a bridge across the promenade, the cruise staff excites the crowd with dancing and zany activities. This cruise had no enrichment programming to speak of. It surprises me that Royal invests millions of dollars in each of its ships for an art collection while at the same time concluding that its guests would not appreciate entertainment for the mind. Freedom provided a comfortable ride but then there were no challenges presented by bad weather. The ship maneuvers well in port. ​The passengers on this cruise were a mix of ages. However, because school was in session in North America, there were few children. Most of the passengers appeared to be from the southeastern United States, particularly the states above Florida.